3-2 on Tuesday for +1.73 Units!!! Wednesday plays picked up with 5 plays going 3-2 for +1.72 units. 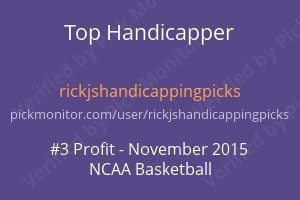 In College hoops, we won with Bowling Green +10 84-89 and lost with Texas A&M +14.5 58-100. In the NHL we won with the Kings +131 2-1, Winnipeg +142 6-4 and lost with Edmonton +142 1-3. Overall a +1.73 Unit day. Today so far no plays have been sent out. Unlike yesterday there is nothing in the NHL that was obvious this morning. In the future expect obvious NHL plays first thing in the morning similar to MLB. The lines moved substantially our way on two of the games so it worked out well getting these in early! 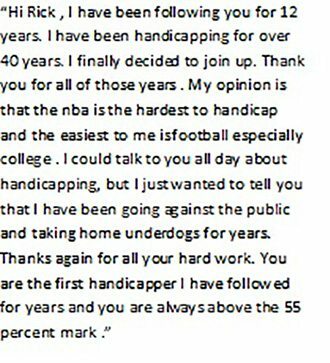 I have been getting a few emails regarding the work I put in handicapping each day. I appreciate the concern:) However, I can assure you that I enjoy handicapping sports. It keeps my mind sharp and is an interesting challenge in as much as most that attempt this do not have a chance to succeed. In addition, it fits into my lifestyle now that I am absent from the poker world. I spend my working time trading stocks and handicapping rather than sitting in casino’s that surprisingly still allow smoking in their buildings. I do not miss it one bit! Expect plays today about 5 to 15 min before game times in spread sports. In money line sports I will put out plays when I feel they are obvious.